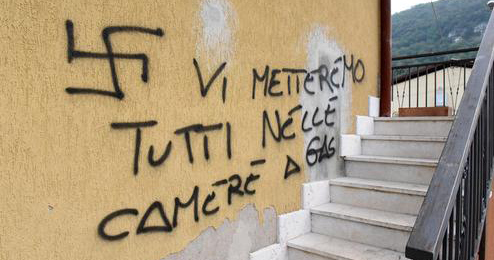 The attacker threw petrol at the couple in the middle of the night, after their Verona home was vandalized with Neo-Nazi graffiti. News 14 September, 2018 . Written by Sarah McKenna Barry. An Italian gay couple was attacked in the middle of the night in their home in Stallavena in the province of Verona. Angelo Amato and Andrea Gardoni awoke to noises coming from outside their apartment, and when Gardoni opened the door an unknown man threw a bucket of petrol at him, damaging his eye. Additionally, the attack caused Gardoni bruising as he fell to the ground. The attacker fled before he could start the fire. Three extra cans of petrol and bottles of spray-paint were found on the landing, and their building had been vandalised with swastikas and graffiti reading: “We will put you all in the gas chambers”. Additionally, the men reported receiving written death threats in the post. The incident in Stallavena comes just over a month after a separate homophobic attack in Verona. On August 11, a married couple were holding hands when they were assaulted by a group of men outside the steps of the Gran Guardia Palace. The group verbally assaulted the couple before punching one of them in the face. A 21-year-old man was arrested and charged with harassment, personal injury, extortion and brawl. “We are witnessing a very serious and alarming increase in homophobic and transphobic violence. Fascism in this country is out of control. They are legitimized and strengthened by the current government policy. “In a Republic that is based on an anti-fascist constitution, these attacks are more than enough to motivate a firm and urgent intervention from the government. Piazzoni sent his love and support to the affected couples and the organisation announced that it will soon release its plan to counter anti-LGBT+ violence in Italy. 14 September, 2018 . Written by Sarah McKenna Barry.